The Giant Anteater uses it's powerful front claws to dig into the heart of a nest or hill then inserts a thin, long and sticky tongue into the the heart of the colony to pick up the insects. Additional information about the Giant Anteater Graphic: The Giant Anteater is as big as a large dog. 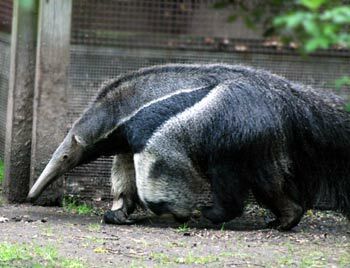 The Giant Anteater eats ants and termites almost exclusively, up to 30,000 in asingle day. Siteseen Ltd. are the sole copyright holders of this Giant Anteater picture, unless otherwise stated. We only authorise non-commercial picture use and particularly encourage their use for educational purposes. This Giant Anteater picture is not in the Public Domain. 3) Use of this Giant Anteater picture, or any of our pictures on websites re-distributing copyright free material is strictly prohibited.